LOUISVILLE, Ky. — The Kentucky Derby has been run 138 times. According to Kentucky’s military history, the National Guard has been assisting with the event since 1936. Many years have gone into the coordination and partnerships with local authorities that have protected the “Run for the Roses” as the signature event in the commonwealth. That teamwork was no different for the 139th running of the race, May 4, 2013 as Kentucky relived its annual great two minutes. To see more photos from the Derby, click here. 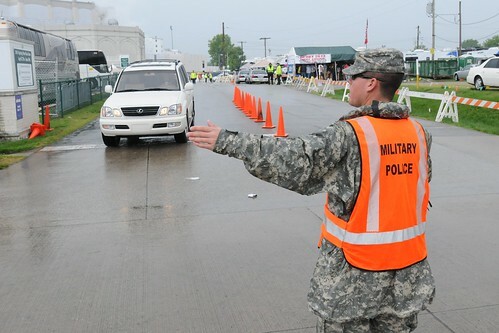 The goal of providing a safe and secure weekend at Churchill Downs has always been the focus of the Kentucky National Guard along with agencies such as the Louisville Metro Police, the Jefferson County Sherriff’s Office and Kentucky State Police to name a few. The basics of this effort remain the same, but sometimes the manner in which that effort is enacted must be adapted to the world we live in. “We certainly have a more heightened sense of security,” said 2nd Lt. Corey Rich of the 617th Military Police Company and officer in charge of security and traffic for National Guard personnel. 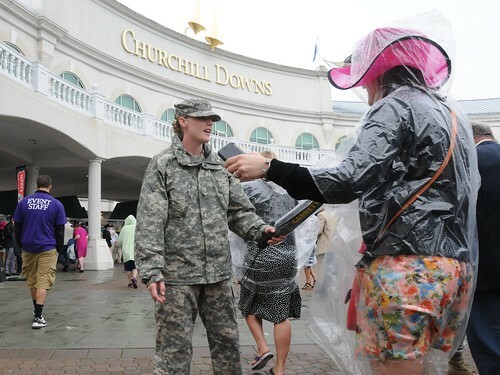 At the two largest gates of Churchill Downs, Guardsmen took their usual stance in being the first line of security fans encounter. Several Soldiers at each gate were issued metal-detecting wands as an added measure of inspecting individuals. The gates require an attention to detail, but also a friendly patience in greeting the estimated 150 thousand spectators entering the track. Lt. Carolyn Nunn, a 20-year veteran with the Louisville Metro Police Department complimented the Guardsmen for their interaction and persistence. 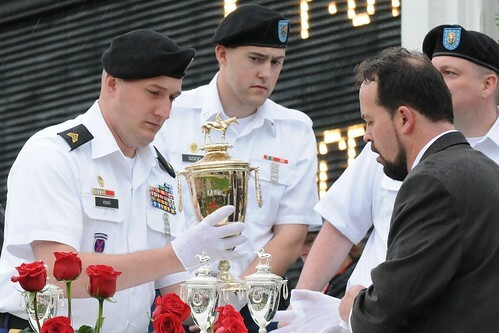 Perspectives of the Kentucky Derby varied depending on the location of the roughly 250 Soldiers and Airmen on duty. From the gates, down the backstretch and in the streets surrounding Churchill Downs, the Kentucky Guard demonstrated it’s fidelity to Louisville and the Commonwealth. Pvt. Shalah Barnes with the 940th Military Police Co. worked her first Derby, her second assignment. Only two months removed from training, Barnes was still learning the ropes of being a Soldier and a MP, and getting to experience the Derby from the backside, where the horses enter the track gave her a unique perspective on the day and the people that are involved. On the opposite side of the track, for all to see, including the television cameras, Soldiers and Airmen had traded their camouflage for dress uniforms to perform the duties of a more formal security. Chief Master Sgt. Ray Dawson, 123rd Airlift Wing, was working his fourth Derby and said his detail was all about being professional in adverse conditions. 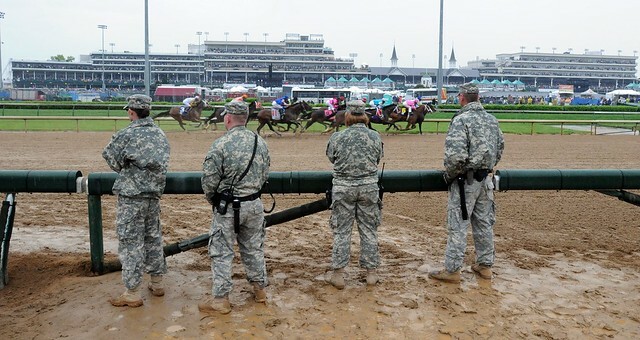 Guardsmen secured the winner’s circle and the Kentucky Derby trophy at the center of attention in a more refined presence, even in the wet and chilly conditions. Despite the rain that soaked poncho-covered spectators and Guardsmen alike, the 139th Kentucky Derby was another successful day for Louisville and for Kentucky. Local authorities said the event went off with no major incidents. Kentucky Guardsmen remained on their security and traffic details well after the last race had concluded and the grandstands and infield emptied. 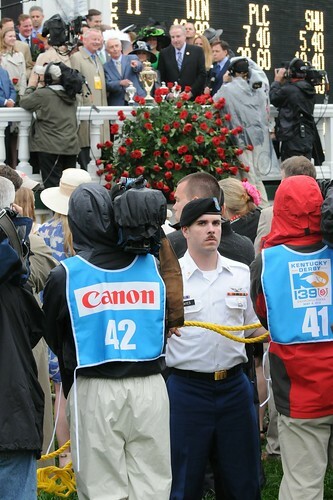 The Kentucky Guard now begins the year-long preparation for the 140th running in 2014.